This is the campaign log for the Twenty Second session of a google+run Wandering Heroes of Ogre Gate campaign. The previous session is described HERE. 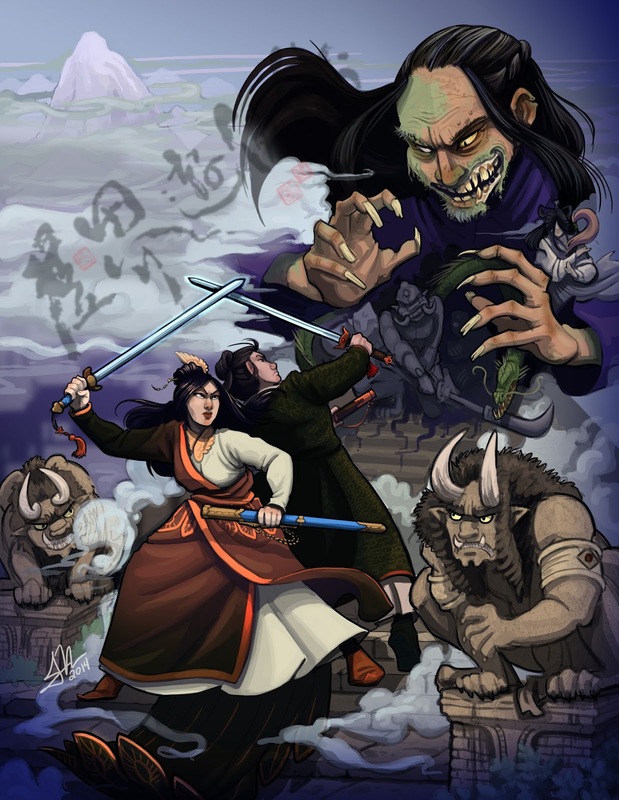 This session resumes the efforts of Chen and San to trade the Immortal Killing Swords for the Phoenix Talismans from the Temple of Supreme Righteousness. Chen and San had come to a peak in the Banyan mountains and scaled it to reach The Temple of Supreme Righteousness. They brought Nergui (the Kushen King's chief adviser) and Princess Sarnai (the King's daughter) along for the journey. Previously Chen was made a commander of 10,000 in the Kushen Army, giving him a great deal of influence among the invading tribesmen. They found narrow stairs carved into the peak and began to climb them. As they did, Negui and Chen began to feel heavy and slow, as if some supernatural force was weighing them down. A voice boomed "Leave the Immortal Killing Sword and turn back." Hesitantly they continued forward, and Nergui was lifted into the air by an unseen force, he disappeared around a bend and moments later came crashing down the steps before them, dead. Chen grabbed Nergui's Meteor Hammer and the party fled back down the mountain but were pursued by three disciples of the temple. They managed to defeat them quickly, taking one prisoner, and continue on into the desert. As they traveled they became lost and found themselves in the middle of a sandy maelstrom that swirled like a whirlpool. Princess Sarnai was sucked below, disappearing into the sand. Chen and San managed to leap out of the way. 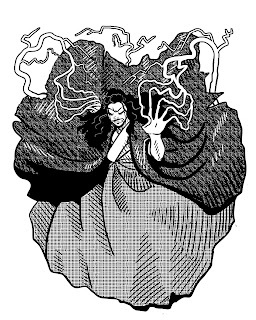 Taking the chain of the Meteor Hammer, Chen lowered it down and dropped himself into the sands to rescue Princess Sarnai. However he slipped through the sands and fell thirty feet to a cavern floor. Above him he saw swirling sands and beside him was Princess Sarnai. San lowered the chain again, and they were able to leap onto it, then climb out. When they reached the surface, Princess Sarnai saw a nearby outcropping of red stone. Chen inspected it and saw that it had a likeness of Hen-Shi with script written at its base reading: No man shall enter. Enraged by the incident, Chen used Stone Shattering Finger Technique to destroy the statue. It immediately shattered into thousands of fragments and a burst of red energy flowed from the stone into his chest leaving him irritated and itchy. When he opened his shirt, there was an eye peering from his own flesh near his breastbone. They decided to travel to Heaven Palace Sect and speak with Dawa on the matter. It took them a couple of days and when they arrived Chen informed her about what had happened. He also gave her the prisoner they'd taken from Temple of Supreme Righteousness (which delighted her). She told him that they might not be powerful enough to confront the Temple yet. She would look into the matter and try to find a solution. In the meantime she told him that she could use her talismans to remove the eye but it would come at the cost of one of his own eyes. Chen thanked her and said he would use that option as a last resort but would investigate the matter himself for a while before making a decision. As they left they saw that Qinwen was still strapped to the wall and serving as a source of amusement for Dawa. They went back to their fortress in their newly acquired land between Snake Peak and the Hill of Opulent Fruits. When they arrived, Chen went to speak with Miss Hai*. He asked her about the eye and she said it appeared to be an Eye of Hen-Shi, which was a kind of curse used by Hen-Shi sect to help them track and understand their enemies. She believed the could sense everything he saw or heard. Chen thanked her and went to meditate on the matter. San went to pay her respected to her Sifu, the Witch of Zhaoze Zhou. She found her in a new hut, about half a mile away from the fortress. There were animal skulls on posts along the approach to the hut. When she arrived her Sifu was pleased to see her but appeared concerned. She gave her a coin necklace that had the characters: Phoenix-Dragon-Spirit-Enduring written on it. She told San to wear it at all times and never to take it off (under any circumstances). San asked if there was a solution to Chen's problem and the Witch of Zhaoze Zhou told her that with a couple of well selected human sacrifices she believed she could eliminate the eye. San left to bring this news to Chen. In his meditation, Chen saw a vision of a great diamond statue in the shape of the one he'd destroyed. He had a sense that it was in a region far to the south, and saw it being erected near maelstrom. He told his second in command to organize an expedition. They debated the numbers but settled on taking 10 Heroes and 20 laborers. His commander informed him that the men were nervous about the Witch of Zhaoze Zhou, that several of their number had gone missing and most believed she was responsible. Chen said he would take care of the matter and went to visit the Witch himself. On his way he bumped into San who told him about the witch's solution (and about her necklace). Together they went back to her hut and he asked her about the missing people. She confessed to killing them, as part of a ritual to make a special neckless for San. 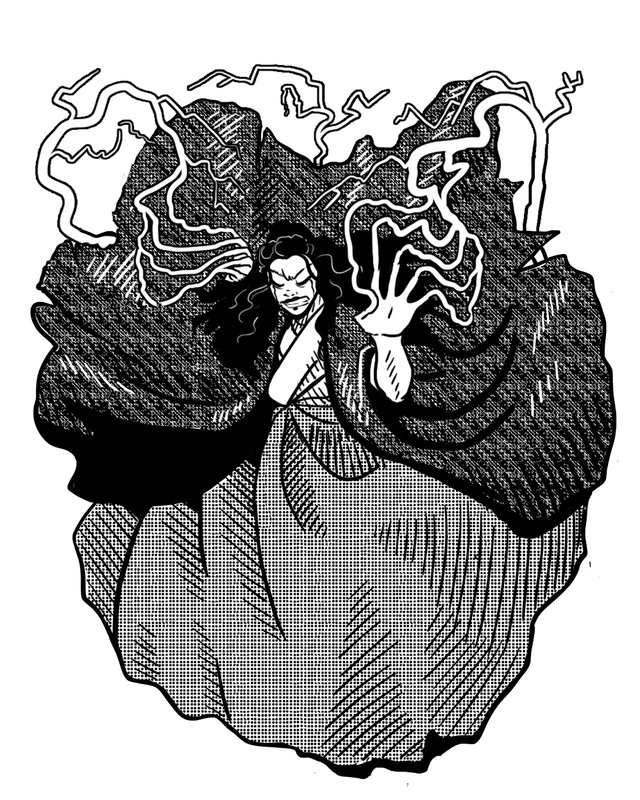 Chen demanded to know the nature of the necklace and she informed him that it would protect her spirit, making it possible to resurrect her should she be killed. She then reprimanded him for taking her disciple on dangerous missions to face powerful sects. Eventually they worked out an arrangement where, if she needed sacrifices, she would go through Mr. Kwan (their contact among the villagers) to find suitable people. She would no longer kill any of his Kushen soldiers or his bandits. He also said he would seek his own solution to the eye problem. Before going south they went to pay their respects to Ganbaatar (leader of the Kushen). On their way they noticed many of the farmers in their land glaring at them. Chen went up to one of them, a man named Zhongong and asked what the problem was. Zhongong called him a traitor to the Daoyun people and scolded him for allying with the Kushen. He said the farmers were angry because their land had been taken and they were forced to pay a heavy tax to the Kushen. Chen was unaware this arrangement was all that different from their previous one and asked for more information. Zhonggong informed him that many of the people owned the land themselves or worked the land owned by landlords (and in many cases had an agreement where they worked the land occasionally). Since the Kushen came, they'd lost many of their rights and were forced to work land now handed out to individual Kushen leaders. Chen told Zhongong he didn't want to be unreasonable. That he would allow Zhongong to speak with the other famers and find out what sort of arrangement would be acceptable (within reason). Zhongong accepted this and said he would begin speaking with everyone. They then continued on their way and reached Ganbaatar's encampment. When Chen arrived he gave him a white steed named Lightning, saying it was one of his best horses. Chen told him about Nergui's death. Ganbaatar was not angry with Chen and did not blame him (he only asked how Nergui died) but he announced Nergui's death to his men and promised that they would settle their grudge with the Temple of Supreme Righteousness within the year. Chen and San then headed back to the fortress and prepared for their journey south. *Miss Hai is a living head they found in the Emerald Empire. She is an old aunty of Zhang Kang (the Bandit King) and a great storyteller.